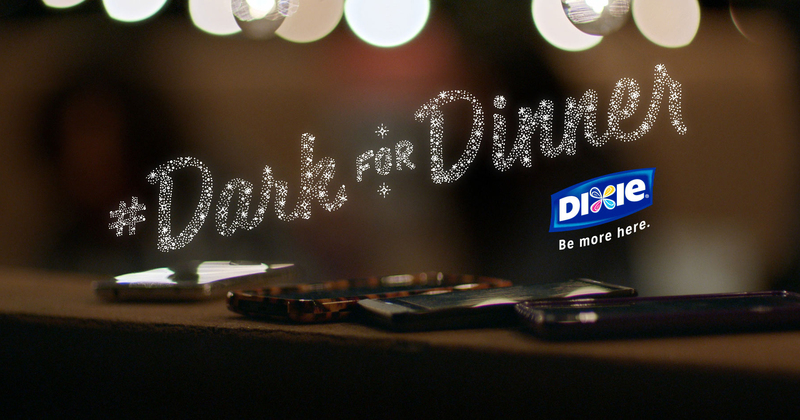 Dixie® wants you to go “Dark for Dinner” by ditching your digital devices, and (gasp! )… talk to your family during mealtimes. Starting every Sunday beginning June 14, Dixie is asking families to remove all distractions, including electronics, at dinnertime. Afterward, everyone is encouraged to share a moment from their Dark for Dinner experience by using the hashtag #DarkForDinner. According to a national survey commissioned by Dixie, the top distraction among families during dinnertime is getting telephone calls followed by emails, text messages and having the television on in the room. And adults aren’t off the hook – in fact, 70 percent said adults are the worst offenders when it comes to being distracted at the dinner table. Turn your social feeds “dark” – take a break from scrolling through your newsfeed or sharing on any social network to let everyone know you’re disconnecting for a while. Put away your devices – place them in a drawer or in another room during dinner, and enjoy the time with your friends and family. Life is full of distractions, responsibilities and demands for time and attention, which makes it easy to forget to focus on the present. As a brand, Dixie saw an opportunity to be the antidotes to life’s distractions by encouraging consumers to spend more meaningful time together, especially during dinner. Be on the look-out for Dixie’s new national television ad campaign which features four real groups of families and friends who agreed to put their phones away for the night and get deep with each other over dinner. Check it out here – Dark For Dinner.